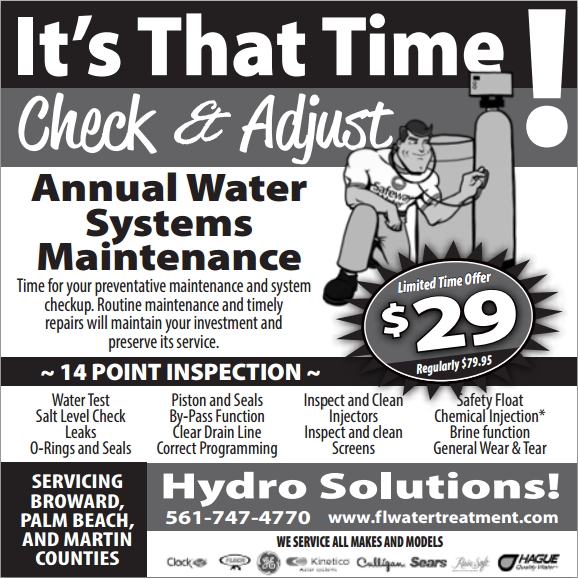 Have you had your Annual Maintenance performed on “Your” home water system? A properly constructed and maintained well or water treatment system will provide you with many years of quality service and quality drinking water. The National Ground Water Association recommends routine annual maintenance checks to ensure the proper operation of the well water treatment system. This will prolong its years of service, as well as help you maintain the best water possible. Keeping up with routine annual maintenance can help prevent waking up a day before that big holiday with no water and getting hit with an emergency repair bill of hundreds of dollars. Annual maintenance done before the fact may just save you money in the long run. We will assist with looking at components that may be at the end of their life and you can budget the expense in preparation for its replacement. Being proactive here can save you time and money. What Is Performed At Your Annual Water System Check? Perform a water test on site. Leak checks on seals and o-rings. Timer programming and valve function. Inspection for general wear and tear. Inspect well head and MORE…. Following the Annual Water System Check you will receive a copy of the work order that will explain the results and list out any recommendations we may have for you. How To Schedule Your Annual Water System Maintenance? Contact our office and mention this blog and receive the discounted price shown exclusively below.